In my last post, I talked about how I learned how to turn different types of shoulders and pivots. The process involved taught me how to use my use my gravers and I mentioned that they were going to be the foundation for my next two projects. For this entry, I will be focusing on the process for making a balance staff. The first project that was up was learning how to turn a balance staff. As much as I wish I had plenty of pictures, I really didn’t stop to take many pictures during this process, so I will do my best to explain the process so it makes sense. When turning a balance staff, it is important to note that you turn the entirety of the staff before you part it off, and apply the finishing touches after that (I do have a picture of this, so it will make sense in a bit). It is important to know the parts of a staff and have a blueprint. *Note* I worked from right to left on my steel rod. The upper pivot is on the far right of the diagram and the lower pivot is on the far left. When I started my staff, I first figured out the overall length of the staff and added about 2 mm extra to the length and had that protruding from the collet. After that, I took the length from the balance hub to the upper pivot and started turning down my first diameter. 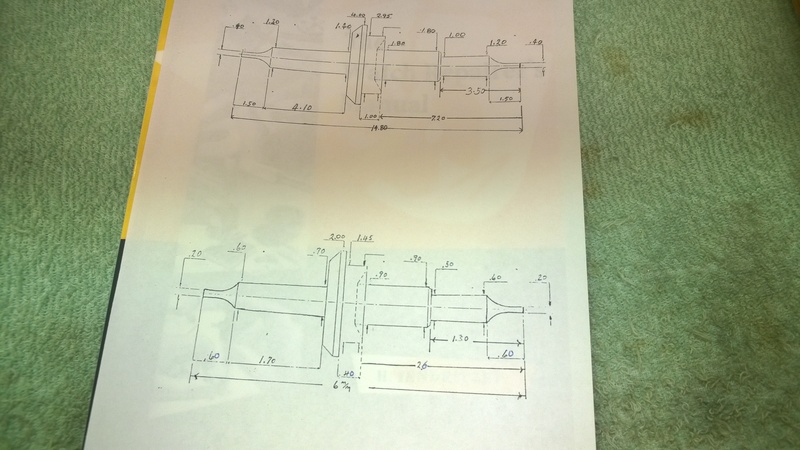 The reason for this is simple-if I can set the maximum diameter first I could focus on working outside in (slowly working my way to the largest diameter), that way, if I made a mistake I could cut off the mistake and extend the balance hub measurement backwards and start again. If I messed up on the balance shoulder, I could extend the hub backwards, turn the balance shoulder into the collet shoulder and the collet shoulder into the oil groove/upper pivot. After turning the initial diameter, I started on the upper pivot and oil groove. If you look at the blueprint, you can see a taper from the beginning of the pivot moving inwards towards the hairspring/collet shoulder. Instead of forming the taper right away, I waited until right before forming the slope of the hub to form the taper (again, this is in case there was a mistake made, I don’t have to remove too much material). After that, the collet and balance shoulders came next. These were very easy to do since they were straight shoulders. Besides the bevel on the collet shoulder, there is a unique feature that I had to learn how to make. In the balance shoulder, there is a riveting undercut that needs to be cut-in most staffs, you rivet the wheel to the staff, and the undercut allows the wheel to be riveted. To form the undercut, I had to turn my graver so the point was going straight in and the angled face of the graver was facing me. I also used a different graver that had a steeper applied to it. I had to resharpen this graver a couple times before I learned how much pressure and how to hold the graver without breaking the tip. Once the riveting undercut was made, I went back and tapered the oil groove. After that, I polished what I had done so far. From there, it was time to form the slope of the hub and then the roller seat-which are pretty much the same thing (the slope of the hub will form the boundary of the roller seat). For this process, you can go about doing this one of two ways. 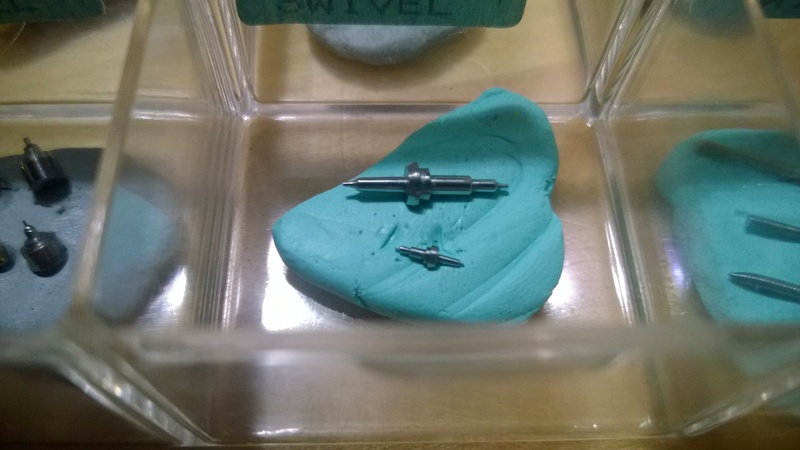 The part-off tool is a lot easier to us and allows greater control of this procedure. As with everything done before, I turned the entire diameter to thickness of the roller shoulder. The taper and lower pivot come a bit later. Once the diameter has been cut, you want to part-off (cut-off) the piece by turning the very end into a point (remember, it was left a bit longer for this purpose). 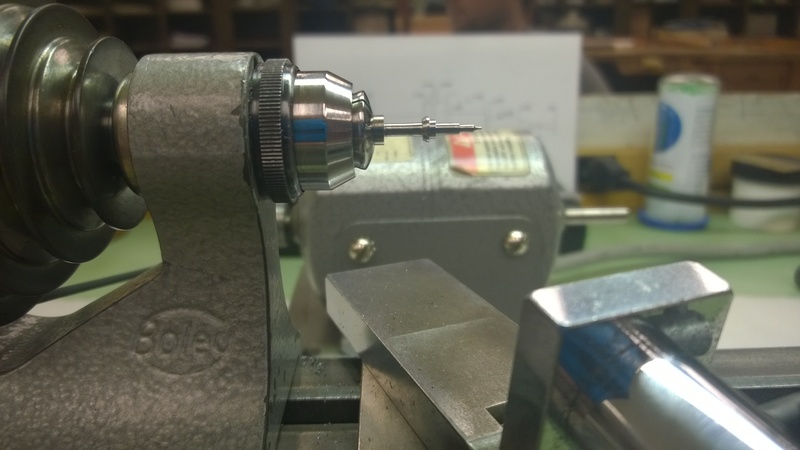 Once you part-off the piece, you need to use a collet that is small enough to hold the staff by the balance shoulder. When you have the staff reversed and in place, you now need to trim the staff to the proper length. While it is tempting to try and taper the roller shoulder, don’t-if you try to do that, your upper and lower pivots won’t be on the same line of center. Once the overall length is set, you need to get the taper and lower pivot formed. To do this properly, you need to use a shellac collet. A shellac collet is just as it sounds-it is a collet that has been hollowed with a cone shape. You melt some shellac and allow it to cool for a moment and then place the staff in the shellac (upper pivot, obviously). There are two things you need to do at this point. Press the staff in firm enough to have the tip of the pivot in the tip of the cone. Hold it in place and allow the shellac to cool. Once the shellac has cooled, slowly spin your work and make sure the staff doesn’t fall out. After getting the staff in place, put the tool rest close to the staff and grab a piece of sharpened pegwood. Gently warm the shellac and place the point of the shellac under the end of your staff and slowly rotate the staff while apply slight pressure with the pegwood. This will allow the point of the pivot to center itself in the cone which will allow you to true your work. Once your staff is trued, it is time to finish it out. Turn the taper very carefully all the way down to the beginning of the lower pivot. Form the lower pivot and then polish your work. Gently warm your shellac collet one more time to remove your staff and soak it in alcohol to help remove any stuck on shellac. I ended up making two balance staffs, one with an overall length of 14.80 mm and a maximum width of 4.00 mm and the pivots were .40 mm. The other staff was 6.00 mm in length with a maximum width of 2.00 mm and the pivots were .20 mm.